Homify is an architecture and interior design platform that connects professionals and users. Looking to remodel your kitchen, get ideas for your garden or find the perfect architect to plan your dream house? 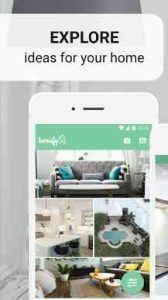 The homify app will help you find all the tips and help needed to carry out your projects or simply get inspiration for your home. Filter your desired style of decoration (Country, Modern, Scandinavian, etc. ), the room in your home that you want to decorate or remodel (Kitchen, Garden, Bathroom, etc.) and find images that perfectly suit your taste. You can also filter each selection by newest, popular today and all-time popular. Pin the images you like best in an “Ideabook” to save them so that you can see them again at any time convenient for you. You can also show them to professionals to ensure that they understand your requests and ideas. Click on the images that interest you most and you’ll be able to access the profile of the corresponding architect, interior designer or other professional, and directly get in touch. With projects and professionals from more than 30 countries ready and waiting on homify, there’s an expert available in just about every corner of the world – you can simply find the right one for you by using the location filter. The homify magazine is updated on a daily basis. Whether you’re interested in low-budget houses, want to know how to furnish a small kitchen or craft a beautiful little garden, homify has got you covered. You can also simply save the images and articles that pique your interest in ideabooks, so that you can come back to them later. Having established itself as a global platform in the architecture and design world, homify has been recognized and featured in numerous world renowned publications including Vogue and Cosmopolitan. From inspiration to action – homify will guide you every step of the way to designing and building the home of your dreams. A new window of mind opens towards planning a sweet home close to heart. Love it!